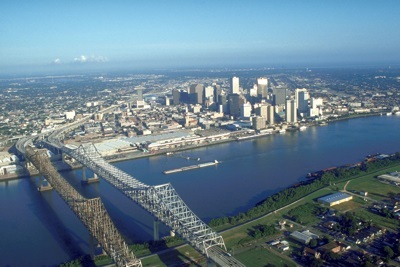 New Orleans is a city located on the Mississippi River in southeastern Louisiana. The city, which was founded in 1718 and is one of the oldest in in the United States, is bordered to the North by Lake Pontchartrain, and to the East by the Gulf of Mexico. As you are probably aware, the city of New Orleans and the surrounding area was extensively damaged by Hurricane Katrina in 2005. As of 2007, the city had an estimated population of 273,000, and the Greater New Orleans metropolitan area had an estimated population of around 1.2 million. This represents a significant fall since the pre-Katrina figures which were around 485,000 and 1.4 million, however the population is now on an upward curve and gradually recovering. New Orleans is a popular tourist destination. Attractions in the city include the city's multicultural heritage especially cuisine (including Cajun and Creole cuisine, as well as New Orleans French), jazz music (which originated in the city), and of course the annual Mardi Gras festival. Visitors can also see the New Orleans Mint (formerly a branch of the US Mint), the National World War II Museum, and the many art museums and gardens in the city, as well as ride on the Str. Natchez, a sternwheel steamboat.